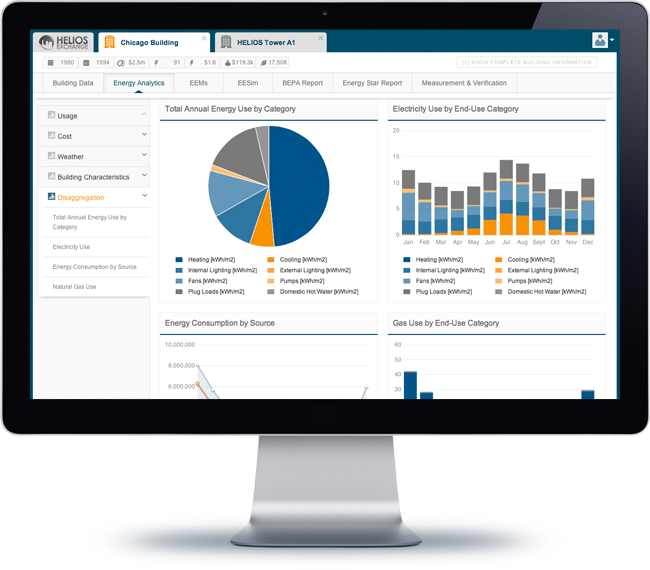 Helios’ tools streamline and standardize energy efficiency program management. Utilities are faced with the management of multiple energy efficiency incentive programs that are offered in the commercial marketplace, in their service territories, or unregulated markets. Inconsistent energy analytics, project evaluation and approval methods, as well as post-retrofit measurement and evaluation can become huge program overhead costs. Linking EPA benchmarking data, energy performance and savings estimates, using a consistent framework, utility program managers can easily review commercial energy efficiency projects for incentive funding. Ranking projects based on consistently calculated energy savings estimates, rather than conflicting methodologies, can be used by internal staff or program contractors. Providing the tracking tools and historical database necessary for ongoing project performance tracking, measurement, and evaluation after each project is built. Coordinating the information necessary to approve energy efficiency rebates or incentives. Supporting ongoing multi-year program management.